Since the 5th August, 2013, announcement of Glen Eira’s introduction of the new planning zone (the first Council to do so) much has been said/written in the State and Local Media and on various social networking sites – commentaries on the zones have been both positive and negative. When the new planning zones were first announced in September, 2012, GERA made a submission to the Minister and website comments (GERA website “New Planning Zones”). Since then Glen Eira Council’s continued silence (despite repeated requests from residents and in contrast the majority of other Councils) on the implementation of the zones has made meaningful comment impossible. The information released by Council since 5th August is scant and includes “before and after maps” which are difficult to compare (street identification) and inadequately identified commercial zones (same colour as parks and schools). The 5th August announcement makes it apparent that the assumption that Council was working on the zoning changes and would present them for community consultation prior to seeking the customary Ministerial Approval was flawed. Residents will not be given the opportunity to have input into the zones (boundaries or content) that they deserve and have a right to expect – Council is presenting residents with a fait accompli. Full details of the planning zones are scheduled for release tomorrow (23/8/2013) – after gazettal ( ie. legal enactment). Shortly thereafter GERA will comment on the zones (boundaries and content). This current posting will therefore concentrate on Council’s implementation of the zones interspersed with some background details. Please note that, in line with our September 2012 posting, GERA expects that there will be both positive and negative aspects within the zones. 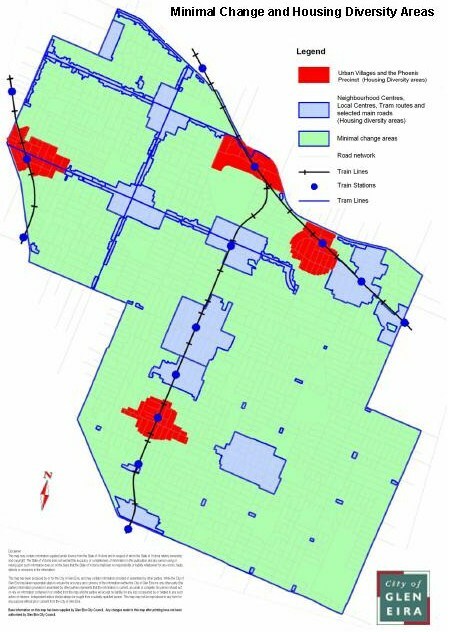 Residents in the former minimal change areas that are now designated as Neighbourhood Residential Zone are likely to be grateful while residents in the formerly designated Housing Diversity areas that are now designated General Residential or Residential Growth Zones are less likely to be grateful. To revert to Glen Eira’s zone consultations – the new zones were first proposed in September, 2012, and were formally enacted in July, 2013. On enactment, Councils were provided with a 12 month window (i.e. until June, 2014) for community consultation and formal drafting their zone designations and schedules. Unlike previous zoning (ie. Minimal Change/Housing Diversity/Activity Centres etc.) which related to areas, the new zones and schedules enable Councils to plan for the development of their municipality in much greater detail (eg. street by street, lot by lot). The content of the zones was prescribed by the Minister and the Schedules, attached to the zone, provided Council with discretionary control options (eg. set backs – hence the Glen Eira’s two divisions of the General Residential Zone). Glen Eira, like all Councils is required, under the Planning and Environment Act 1987, to review their Planning Scheme every 4 years. Glen Eira’s last review of the planning scheme involved community consultation end of 2009/beginning 2010, with review results being formally published and submitted to the Minister in August, 2010. The above indicates that Council had a unique, timely opportunity to consult the community at a detailed level by either delaying zone implementation or bringing the review forward. Yet, despite the Mayor describing the zone implementation as being the “biggest planning change in Glen Eira’s history” and other Councils actively informing and involving residents, rather than consulting Glen Eira Council opted, under Section 20 of the Planning and Act, to apply for a community consultation exemption and a Ministerial Amendment (C110) to the Glen Eira Planning Scheme. The next opportunity for residents to comment on the planning scheme will be 2017/18. The Local Law requires Council decisions, unless those decisions are covered by Councillor approved delegations of authority to Administrative staff, to be made at open Council Meetings. (Delegations of Authority being intended to provide the Administration with the necessary authority to conduct the day to day activities of the municipality). The decision to apply for a Section 20 exemption was not made at an open Council Meeting, nor is any discussion on the Section 20 exemption recorded in the Councillor Assembly Records. This raises serious governance issues re Council decision making (who made the decision – it is hard to argue that such a major change to the planning scheme fits within delegations of authority) and how Councillors can request a Section 20 exemption to consult the community (those most impacted) without it being discussed at an open Council Meeting. The Minimal Change/Housing Diversity policy has been in place for over 10 years and is well understood by residents. The new zones are a direct translation. Council undertook extensive community consultation during the 2009/2010 Planning Scheme Review and is aware of what resident aspirations. Undertaking community consultation would not have resulted in any significant difference in zone application outcomes. To re-iterate a point made earlier residents have advised GERA of many requests made to Council, and individual Councillors, regarding zone implementation and community consultation. While we cannot repeat all of them, attached is a dated extract of public questions asked by residents (which Council is legally bound to answer, not merely respond to). While being fully aware of how slowly that the wheels of government move, GERA again leaves it to residents for form their own views on the timing/quality/semantics of the responses and to note references to Ministerial Direction without mention of Council’s Section 20 application for that direction. For those interested in verifying the public questions a link to the relevant full Council Minutes is provided in the foot notes. GERA’s position on the new zones is that, in line with our initial objection lodged with the Minister, while there are some aspects of the new zones (eg. mandatory height limits, greater detail) that are welcomed there are also some adverse offsets (eg. creep of commercial activities into Neighbourhood Residential Zones, restricted third party rights of appeal) which will be the subject of a later post. 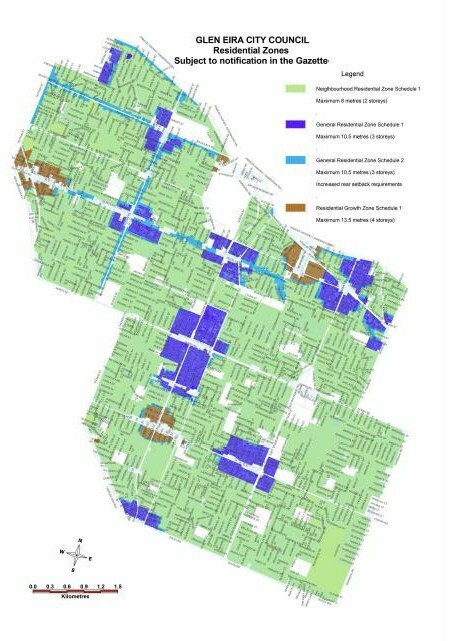 GERA believes the community should not only have been informed of the zones, schedules and their implications, they should also have been given the opportunity to review and provide input into Council’s introduction of the zones. Council denied residents that opportunity by lodging a Section 20 exemption from consultation and request for a Ministerial Amendment. Council has also delayed making full zoning details available to residents until after the zones are enacted. It is a fait accompli approach to consultation. Please note: All residents should pay careful attention to the information provided tomorrow. The new zones are not a direct translation of the previous Minimal Change/Housing Diversity Areas, nor have the “transitional” General Residential Zone 2 (GRZ2) been “carved” out of Housing Diversity Areas rather than Minimal Change Areas. An example is Ercildoune Street, Caulfield North, in close proximity to the Alma Village Local Centre – previously the street was designated minimal change. Under the new zones, the Alma Village Centre has been expaned to include Ercildoune’s western side (now zoned GRZ2) while the eastern side is designated NRZ1 (ie. minimal change).